The American shopping mall has seen rapid growth over several decades since the 1950s. These retail havens were anchored by large department stores that attracted shoppers and made the American mall popular with the masses, but the rise of e-commerce and the explosion of online shopping have changed the retail landscape irrevocably. Mall owners are looking to attract new and innovative business concepts to provide a more attractive proposition for today’s consumers. These savvy operators hope to decrease vacancy rates by attracting long-term leases from tenants with lasting staying power. Movie theaters and malls have been pairing up for years as movie theaters provide a historically reliable entertainment option to mall guests. As more vacancies force operators to look beyond retail, entertainment options are becoming a viable alternative for malls that are transitioning to tenants that offer entertainment experiences as well as traditional retail opportunities. The American consumer’s shopping habits are changing, especially among the millennial generation. Millennials increasingly prefer spending on experiences rather than merchandise, expressing a preference for “doing” over “owning.” This puts the entertainment and attractions industry in a unique position to capture this demand for experience-based commerce. While the trend may be newer, the trend of experiential attractions located in malls is not really a unique concept. Several prominent shopping malls have embraced this concept and offer a variety of experience-based attractions to their guests. 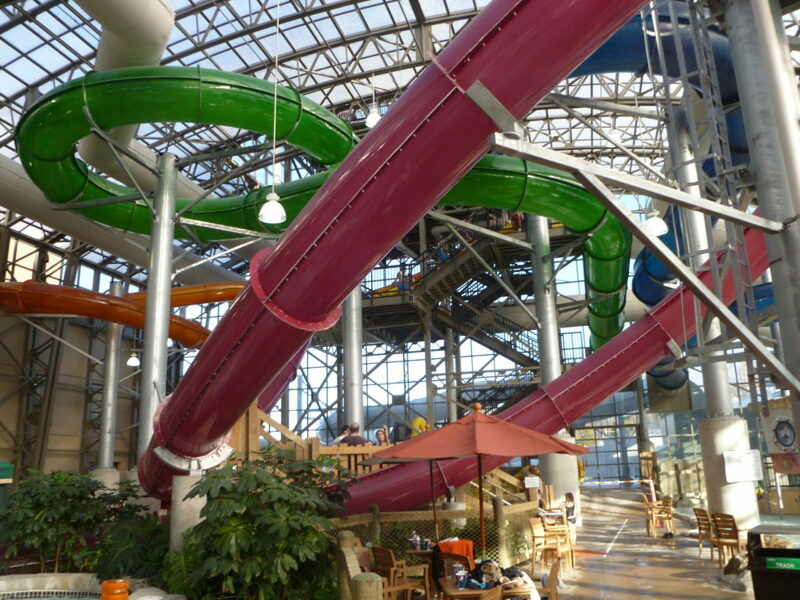 Key examples include Mall of America in Minnesota; West Edmonton Mall in Canada; and American Dream Meadowlands in New Jersey, which count bowling, escape rooms, flying theaters, mini-golf, and even waterparks and theme parks amongst their features. Other major attractions that are part of a mall development include indoor ski slopes like Ski Dubai, which is attached to the Mall of Emirates and Ski Egypt, which is attached to the Mall of Egypt. Madrid SnowZone in Madrid, Spain is attached to Xanadu shopping mall. In the Dallas/Fort Worth area, new tenants at Stonebriar Centre in Frisco include KidZania, an 80,000-square-foot experimental learning center and indoor theme park for children; and Crayola Experience, a 60,000-square-foot indoor amusement center planned at The Shops at Willowbend in Plano. According to a study by leading commercial real estate data source Reis looking at 77 metropolitan areas across the country, the vacancy rate at regional and super regional malls reached 8.6% in the second quarter of 2018, up from 8.4% in the previous quarter. The 8.6% rate is near the high set in the third quarter of 2012, when the vacancy rate was 8.7%. 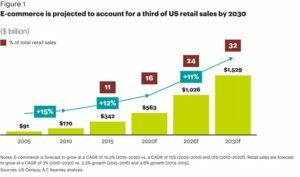 According to real estate consulting firm A.T. Kearney, e-commerce is projected to account for a third of retail sales by 2030. Larger entertainment companies like industry leader Dave & Buster’s are responding by reconfiguring their store sizes to fit in malls. Realizing that these vacancies are in prime locations, about a third of the company’s franchises are now located in shopping malls. Scene75, an indoor family entertainment company, purchased the closed Macy’s at Tuttle Mall in Dublin Ohio. Scene75 offers 4-D motion theater, mini-golf, bouncing inflatables, bumper cars, go-karts, laser tag, laser maze, mini-bowling, and virtual reality experiences. This type of adaptive reuse of vacant mall space is on the rise across the industry. The primary benefit for any attraction to locate in a mall is the foot traffic. Some stand-alone traditional attractions may take more than a year of marketing to gain traction in the market, not to mention the high development costs. The mall location benefits the attraction in two ways, instant foot traffic and large empty spaces priced well below replacement costs. However, given all the benefits, amusement attraction developers and investors must still be discerning about which malls they choose. In some cases, malls that have an increasingly declining attendance would serve as a detriment to any new tenant. Developers need to do their due diligence to better understand the market, tenant mix, past and future projections for mall visitation, and spending potential of the market. The possibilities for indoor attractions are seemingly limitless with successful mall attractions ranging from play areas for toddlers to roller coasters. Larger attractions include indoor waterparks, aquariums, roller coasters, family entertainment centers, bowling alleys, and indoor ski domes. Smaller attractions include trampoline parks, climbing walls, ropes courses, ziplines, indoor sky diving, bouncing inflatables, carnival type amusement rides, splash pads, escape rooms, interactive attractions, indoor go karts and laser tag. The mall of the future is on pace to begin operating as a town center, offering traditional retail with lifestyle and entertainment options. Attraction operators that want in on this growing trend will need to reconfigure and revise their operations and marketing plans to adapt to these new settings. Unfortunately, not all concepts to enter the market will be successful and even the best location is no substitute for a solid business concept and a well-considered business plan. Consumers are becoming more selective with their entertainment dollars. If an attraction does not offer an experience that is fun, immersive, interactive, safe, and affordable, it’s uncertain if people will return regardless of its location. A feasibility study is invaluable to the process of discerning whether this new trend of adaptive reuse of vacant mall space is a good fit for these entertainment attractions. As the retail industry continues to experience large closures, it provides a strong opportunity for both small and large attraction operators to not only be part of the mall setting, but also to realign their business concepts to a new world of mixed-use retail and entertainment. Nuresh Maredia is the Director of Appraisal & Consulting Services at Hotel & Leisure Advisors (H&LA), a national hospitality consulting firm. H&LA produces reports that assist clients in the hospitality and attractions, real estate industry. H&LA specializes in appraisals, feasibility studies, impact analyses, economic impact studies, and litigation support for hotels, resorts, waterparks, casinos, attractions, conference and convention centers, golf courses, ski resorts and other leisure real estate. Our experienced consultants travel nationwide analyzing hospitality trends, studying leisure industries, and understanding local communities. We focus on our clients’ competitive markets and provide thorough and thoughtful analysis of hospitality properties. Our consultants have analyzed and prepared studies on more than 2,000 properties in more than 45 states, Canada, and the Caribbean. You can reach Nuresh in our San Antonio office via email at nmaredia@hladvisors.com or via phone at 210-319-5440.